We have cookouts here every now and then. Sometimes they are adult gatherings, and sometimes they are kid events. Today was a kid event. Our niece Samantha bought a bunch of lawn games and invited several of Jordan's (her son) classmates from the first grade. I cleaned off the deck, and gathered a load of oak and hickory wood for the fire pit. Our nephew Haven got hay for the trailer for the hayride. Once all the kids arrived, they played the games until they got tired, and then went exploring in the chicken pen. I'm not sure what's so fascinating about the chicken pen, but it is. They gathered eggs, fed the chickens and chased them around the pen. We did hotdogs on the grill, and Jilda made a batch of her world famous hot apple cider. 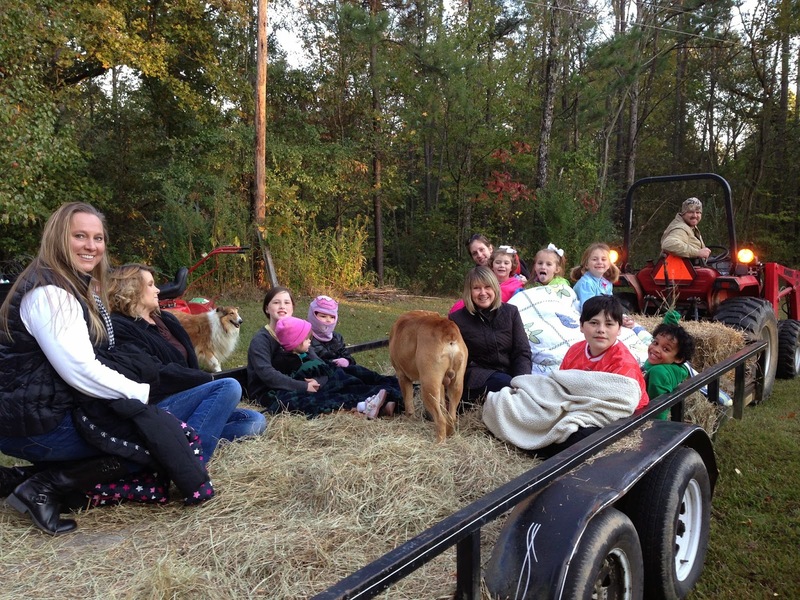 When the sun went down, we loaded all the kids on the trailer and Haven pulled us around the property on the tractor. Once the ride was finished, we made S'mores on the fire pit. About half the kids wanted to stay with us when it was time to go. Jilda and I each took warm epsom salts baths and are about to call it a night. I can almost guarantee that we'll both sleep well tonight. Making memories is hard work. WOW, I wish y'all had been my Aunt and Uncle. What a great memory maker, something they will never forget. You guys know how to do it. So fun! I can see why they wanted to stay..I would too! Sounds like a perfect Fall event. You know how we love our fires and s'mores around here! Rest up and enjoy the rest of the weekend! The cold sent icy spritzing today..brrrr! Looking back, it's the little things that remain. This post triggered memories of gathering eggs in my grandma's chicken coop and marveling at their still-warm feel and the not-unpleasant aroma of the farm buildings. Maybe, but it's all worth it!! You bet ya, making memories is hard work but it's easy to remember the good times, especially for the kids... Everyone seems to be enjoying the ride. You should start putting more pictures on your blog for memory sake. I love looking at picture and see how the kids are growing and changing in my older blog posts. It's amazing how quickly I forget otherwise. What wonderful memories you provided these young people, memories that will remain with them for the rest of their lives. What a sweet memory that will be. Lovely. Sounds like a whole lot of fun...what a great way to enjoy friends and family!